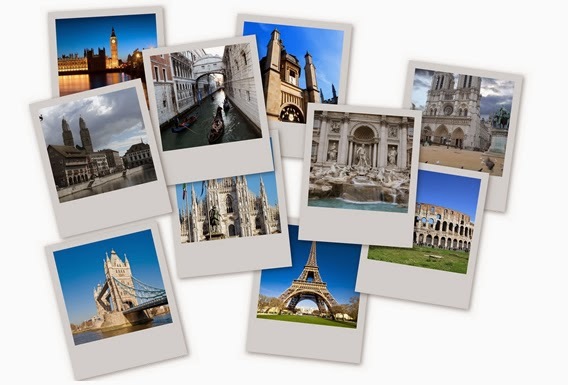 Do you want a trip to several countries in Europe in just one visa? Apply for Schengen Visa. You can visit as many as 26 countries in Europe if you have Schengen Visa on hand. These countries are members of the Schengen agreement which put an end to passport and border control in between their common border. So basically, Schengen area serves as a single country for international travelers. What are the 26 countries in the Schengen area? You might also want to know: Countries Philippine passport holders can visit without VISA. Where can I apply for Schengen Visa in Philippines? For a visit to one Schengen state, visa applications must be lodged at the Embassy/Consulate of that particular Member State. If the visit includes more than one destination, visa applications must be lodged at the Embassy/Consulate of the Member State whose territory constitutes the MAIN destination of the visit(s) in terms of purpose or the length of stay. If your length of stay is almost the same in every country, apply at the country of first entry. Which country would you have a better chance of getting the visa? A recent study published in The Economists shows that France is one of the easiest countries when it comes to Schengen visa application approval. So you might want to apply at the French Embassy when you’re planning a major European trip to have higher chances of bagging that seemingly elusive Schengen visa. When can I apply for Schengen visa? You can apply for Schengen visa in as early as three (3) months before your planned travel. Note that this visa is valid in all Schengen States for a stay of up to 90 days within a six-month period for a visit, tourism or business. How do I apply for Schengen visa? All state members follow a standard procedure in processing visa application. VISA applicants have the option to apply directly to the Consulate Office or Embassy of these states in the country but they would need to schedule an appointment first through calling their hotline or sending them an e-mail. Customer Service Agents are available daily, Mondays thru Saturdays from 8am to 6pm except public holidays. The visa-processing fee is 60 euros which is approximately 3,600 pesos . Children ages between 6-11 years old pay 35 euros (2,100 pesos) while children below 6 are free of charge. The fee is non-refundable even if application is unsuccessful. Payments are made at the Embassy/Consulate when submitting your application and you need to have exact change. What are the requirements in applying Schengen visa? 1. Signed and filled up Schengen Visa application form with photo attached, plus 1 additional photo. Taken with nothing covering the face, without sunglasses or tinted spectacles, or a head covering unless worn for religious or medical reasons. The subject should have their mouth closed (no grinning, frowning or raised eyebrows) and the applicant should be facing forwarding, looking straight ahead. 3. Cover letter explaining the purpose of your trip and detailed itinerary. If you don’t have this, you have to write one on the spot before they will accept your requirements. Accommodations – hotel vouchers, seriously. Here is a list of Accredited Travel Insurance Company in the Philippines. Everest International Group Administrators Inc.
After submitting your documents to the Embassy/Consulate office, you will be given a reference number. Visa processing can be as fast as 5 days but usually takes 3 weeks or 15 working days. Hope this article helped you. Do you have a question about Schengen Visa application? Feel free to leave a comment and we'll try to respond as soon as we can. Good Luck on your European tour!!! During our school days, we were usually asked about the historical stories behind the names of the places we live in. Philippines, for example, came from the fact the our islands were once ruled by Spain and was derived from the name of their King Philip II. 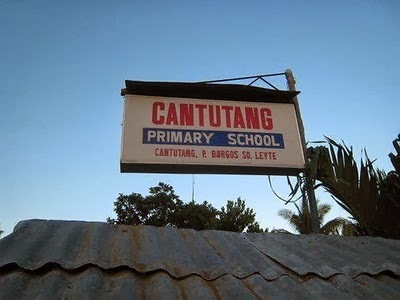 Most of the name of Filipino places have a strong connection to foreign men and/or countries who were relevant to our history. Most of them have Spanish origin like Buendia, Magallanes, Hermosa, Mercedes, Roxas, Puerto Princesa, Castilla and a lot more. Also, as a result of American ruling in the country, we had English names too. From roads like Taft Avenue, Shaw Boulevard and Mckinley Road, to district and province names like Camp John Hay, Brookespoint in Palawan, Eastwood City, Rockwell Center and Forbes Park, Adams in Ilocos Norte, Turtle Islands in Tawi-tawi, Jones in Isabela, and New Washington in Aklan. I haven't heard yet of places which sounds Japanese except for Naga City in Bicol region which actually came from the existence of narra trees in that area. Towns of Anos and Bayog in Laguna, so when asked where Bayog is: "Paglagpas mo sa Anos, makikita mo na ang Bayog." Gubat in Sorsogon, so when asked, "Taga san ka?" the people here responds with, "taga-Gubat"
There's a jeepney going to Bigte in SM Fairviewm so the barker shouts,"Bigte, bigte, Sinong magbi-Bigte dyan?" 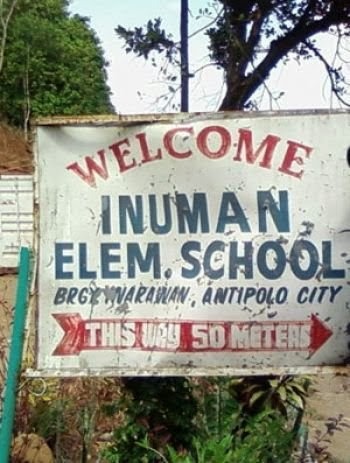 Barangay Hindi in Albay. 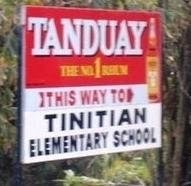 So they have, "Hindi Elementary School", "Hindi Barangay Hall", "Hindi Health Center"
DO YOU WANT TO MEET HANDSOME GUYS? OR YOU MIGHT ALSO KNOW FRIENDS FROM THESE PLACES? ECE Board Exam? What's Life After It? If it's easy, it's not ECE. Yes, Electronics Engineering (previously Electronics and Communications Engineering) is one of the hardest engineering degree in the Philippines. I, personally, have taken this course for five years in one of the universities in the north and have passed through challenges drawing blood, sweat, and tears. Most of my friends might not believe me, but YES, I confess and admit that this course is tough and a bit complicated. Many ECE students and graduates would agree to my thought that sometimes it really is hard to fully appreciate things which we do not see or feel. Electromagnetic waves, flow of electrons in diode and transistor, these are just few examples of the things we studied and knew by heart yet we didn't see or even feel. Enough of this, I just really wanted to prove that I was once a full blooded ECE student who went through the same things an ordinary ECE student have experienced. I don't know which kind of air I breathe today, but I just felt so inspired to write reflections about those days, before and after the exam. Four years ago, I was one of those graduates who attended review, refresher, and coaching (the most important of all) courses in review centers in Manila. To name a few, Excel, PERCDC, Edge, Powerful, ERA, these were the institutions (I've just known that there is TOP now) we have back then (based on my personal experience and my friends' insights about the review program, I would recommend the first three). In that period, I LITERALLY HAVE READ A LOT! Though, I also ended up memorizing those multiple choice type questions, and the Q&A slides presented during the coaching sessions. That was what I basically did to prepare for the board exam and get the precious license card we all have dreamt to put in our wallets. I PASSED! Most of my classmates and friends did too, but the sad thing was there were those who didn't. You might have felt awkward in greeting them the first time you see them personally, or have found it hard to find the best words to use when you chat with them on facebook. Well that's the reality, not everyone will pass the exam at the same time. Unless, the HONORABLE Board of Examinees are so generous that they would let everyone in the same batch to pass. (See passing rate trend) This is barely possible though so let us just face it. Whether you have a license or not, there is this BIG WORLD with full of opportunities waiting for you. License is actually a plus factor when you are applying for your first job. Well, it somehow brings a sense of pride not only to you but also to your family. I, personally, have used my license and the ratings I had in choosing the job I want. I am not sure if it applies to everyone or just me that owning a license makes you a bit choosy to jobs. I am LICENSED so why would I enter this kind of job? Why would I accept that amount of salary? Did you also have these thoughts? I did and I was wrong. I just realized that life after board exam or even graduation is about FINDING what you WANT and if you are adventurous or still a bit confused you can do this with EXPERIMENTING and EXPLORING. But always remember to take an avenue where you think you will enjoy and get inspired. There is a broad range of careers which you can choose from as an ECE graduate. You can enter telecommunications, electronics, IT, broadcasting, manufacturing, navigation, etc. You can also start a business of your own or continue your formal studies. There really are many field and companies which you can enter. In which field do you want to develop your skills? Are you an adaptable person or you are looking for a company culture which you think you will fit in and enjoy? I would say, that salary would be the last factor you should consider when you are looking for your first job. You are searching for your stepping stone, as they say, you are just starting to build a strong foundation. I know a lot of people who entered a high paying job at first but eventually quit to go to a job with lower salary. They just wanted a job which they will enjoy doing, they wanted a job where they will grow. I am not telling you not to accept jobs with good pay but consider first the career which you really wanted to pursue. Imagine it, working in things which you enjoy, discovering new things about yourself. Wouldn't these help you grow? Try to find a career which makes you happy. And surely, MONEY will come soon. EXPERIMENTING and EXPLORING. These are easy yet risky. By doing these, you might either land a career where you will excel, build relationship, and develop yourself. On the other hand, you might find issues in the culture, stability of and your personal development in the first companies you will be in. "I just don't think I can fit in this team culture, I even do not appreciate their values and goals", "Politics is everywhere","I am not sure about the future of this company", "I can't apply my skills here, I might need to find a job where I will be able to show off my special skills, knowledge or expertise". These are the common lines you can hear in every company. Wherever you go, you might hear or even utter them. It is normal to hat e your job for weeks or months. You can quit your job when the going gets tough. But even if you extremely hate your job, you can do some things to make u for it. Make the most out of it. You can ask to change your job description, transfer to a different team or department and work with new people. You have the right to discuss all of these to your managers. Tell them how your work conditions are. Remember, it's also hard to find a new job in a different company. So why not find it in the same company you are in. Aside from the fact that it's easier, it will be faster for you to adapt. Doing these will also contribute to your learnings. Don't be afraid to learn something new. You need them to reach the top. You might also reach the point where moving from team to team within the same company isn't helpful because the things you want for yourself isn't there. This is the time when you need to shift your gear. These few thoughts are too general that you can apply them even if your not an ECE. I just want to emphasize personal development which I believe is the most important. Aside from becoming more effective, it brings a sense of satisfaction in the current career you are in. Isa na namang Pinay ang Aangat Ang Buhay, Is that what you think about Filipinas in a relationship with foreigners? Philippines has been considered as one of the countries where most beautiful women reside. Last year (2013), the world has seen how talented and beautiful Filipinas are after winning the titles in major international beauty pageants. Their natural elegance, strong qualities and character make them very attractive not only to fellow Filipino men but also to foreigners around the world. Pinays in a relationship with or married to foreigners are now very common in the country. Their numbers are increasing especially now that internet and social media is becoming accessible to everyone. Yahoo mail or messenger, facebook and skype are just one of the common internet channels used by Filipinas living in Philippines to meet men from other countries. Aside from finding a person they can be with to build a family , many Filipino women finds marrying a foreigner a way to get out of poverty. That's the common thinking of every Filipino. White men are rich. So everytime you see them with their partners in malls, public transpos, tourist places, or even in your neighborhood you might have these words running out in your mind, "Isa na namang pinay ang aangat ang buhay". (Another life of a Filipina will get well off). To be honest, I had these words coming out directly from my mouth when I was in the Philippines. I was thinking that these women are lucky. Having exotic beauty as their capital, they are able to enjoy the wealth of these foreign men, getting the foreign citizenship, living the happy ever after life of a princess or queen. Last year, I flew to Ireland and met Filipinas who are married or in a relationship with Irish and other white men. Some of them met their partners through internet when they were in Philippines, while others knew their other half while working in Ireland. I have learned and realized a lot after getting to know these people, their lives and their relationships. Cinderella's rags to riches story of Filipinas in a relationship meeting a foreigner really exists. But this is a rare case. Most Filipinas still have to work to live after marrying foreigners. This is the reality. Not all foreigners are actually rich in their country. They don't all work in the office. Some of them have to work outside in a lower type of jobs. The foreign husbands' salary is most of the time not their wives' money. They own it. So their Filipino wives' have to find a job to share with house rent, utilities and food. They can't touch their husband's money and give it to the families they left in the Philippines. They still have to work hard, like a typical overseas filipino worker, to earn and feed their parents and siblings. Having known this, I believed that we should not underestimate these Pinays who have chosen foreign men instead of fellow Pinoys. Yes, all they wanted is to have a better life. They are intelligent enough to use the opportunity of meeting foreigners in finding a well off life. But more than these, they are courageous, they are brave to leave the country and their families, and to have a relationship with a man raised in another culture who might misunderstood and abuse them. We should respect and understand them. Remember that most of them are not living a fairy tale. They are living in a real world like us. TheSummitExpress.com, one of the fastest growing news blogs in the country recently announced a logo making contest, envisioning to improve the performance and brand of the site. The proposed logo for TheSummitExpress represents the simple and minimalist appeal of social media with the desired professional image of the news portal. Color: The creator used white, gray, black and shades of blue for the favicon and backdrop. These colors are carefully selected and balanced such that it will fit the overall look and template of the site while maintaining its professional design. Favicon: The minimalist-type favicon displays the main initials of the site, S (summit) and E (express) , both represented by the shape formed by three bars. Overlaid in these bars, are transparent curves which do not only add gloss to the icon but also represent “express” and “impeccable” news conveyance. The lowest bar is partnered with a sharp pointed tail, which aids in crafting the overall stylish and sensible look of dialogue or expression in the logo. Font: The font style and colors used for the title are intended to be simple to maintain the professional image of the site. Each character are made to appear chiseled and sharpened to derive a superior and reputable appeal. 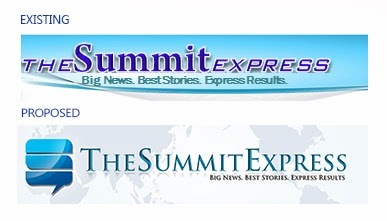 Banner: TheSummitExpress.com is one of the fastest growing news blogs in the Philippines. It has maintained a consistent high rank in Google search engine. As it continues to grow, the creator sees it to extend to as many places in the planet as possible. UPDATE: This logo won the said competition and is now being used by TheSummitExpress in its blogging site and social media pages like twitter and facebook. Do you like this logo and banner? We are pleased to hear from you, leave us your comments and suggestions. Bank of the Philippine Islands (BPI) recently launched its online banking service. This service called BPI 24/7 Banking Service will allow clients to perform banking transactions anytime, anywhere. This new banking service proves BPI's commitment in bringing convenience to its loyal clients. BPI 24/7 Banking is opened for clients to perform their transactions as fast, secure, and easy as possible for them to have time for other important activities. The time saved from traveling to a bank branch or payment center can instead be precious time spent with friends or loved ones. 2. Under the Online Banking Login portion located on the upper right portion of the site, click "Enroll Now" to register your BPI Savings Deposit or Credit account in BPI Express online. 5. Then, you will be directed to Internet Banking Service Agreement. Read the terms and conditions carefully and select "I Agree" or "I Disagree". For clients outside the country, complete the express online registration form. Upon completion, tick the checkbox below to agree on the terms and conditions then click "Submit". One of the largest banks in the Philippines, Metrobank offers Filipinos immediate access to their money saved in the bank with its more than 1,000 Metrobank ATM machines distributed nationwide and more than 2, 600 partnered BancNet ATMs countywide. After having experienced fast and secure service in my payroll account in Metrobank, I decided to open a personal Metrobank ATM savings account. I will be sharing with you the easy steps I have undergone and requirements/documents I have prepared in applying for new Metrobank ATM Card. PHP 2,000.000 for initial deposit for/ maintaining balance of your savings account. Go to the nearest Metrobank branch you prefer to open your ATM account with. Make sure that you bring the complete requirements with you. Proceed to the New Accounts section and ask for Application Form for New ATM Card Account. You can ask for the securities’ assistance or other bank staff’s assistance if you weren’t able to immediately see the New Accounts section. After you have accomplished the application form, the account officer will release and give you the deposit slip receipt bearing your account number. Your Metrobank ATM Card will be released after 7 days or 1 week. Claim your ATM Card on the New Accounts section by presenting your deposit slip and valid ID. Metrobank ATM Card Bank account has an initial deposit requirement of Php 2,000.00. While your account is still open, you need to maintain a balance of Php 2,000.00. In case of failure to maintain a minimum monthly ADM for consecutive 2 months, your account will be charged with a service fee of Php 300.00. For your Metrobank ATM savings to earn interest, you will need to maintain a minimum of Php 10,000.00. The intrest rate given is 0.25% effective on January 1, 2013. Metrobank ATM card can serve as debit cards which you can use when shopping in several department stores like SM, Robinsons, Ayala, Gaisano Malls and other stores with Card Swipe Machines linked with BancNet. Shop/purchase overseas in any Maestro-accredited stores, or withdraw cash in Cirrus-accredited banks in the currency of the country you’re visiting. Lost or Stolen Metrobank ATM card? Find the steps on how you can report and replace lost or stolen Metrobank ATM card here. 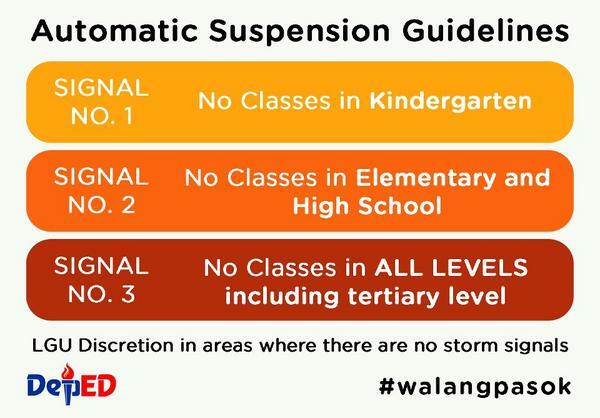 Below is the the list of provinces and cities that have declared class suspensions tomorrow, August 12, 2013 due to typhoon Labuyo. 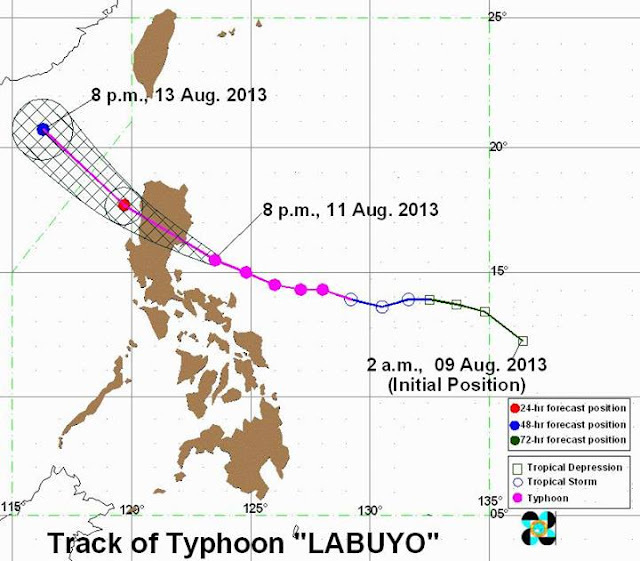 Typhoon Labuyo is expected to landfall tonight in the provinces of Aurora and Isabela. Tropical Cyclone Warning: Typhoon "‪#‎LabuyoPH‬"
Typhoon “Labuyo” has intensified further as it continues to move closer to Southern Isabela-Northern Aurora area. Location of eye/center: At 10:00 PM today, the eye of Typhoon “LABUYO” was located based on all available data at 110 km Southeast of Casiguran, Aurora (15.6°N, 123.1°E). Strength: Maximum winds of 175 kph near the center and gustiness of 210 kph. Movement: Forecast to move West Northwest at 19 kph. Forecast Positions: Typhoon “LABUYO” is expected to be at 100 km Southwest of Laoag City by tomorrow evening. By Tuesday evening, it will be at 470 km Northwest of Laoag City or outside the PAR. • Public Storm Warning Signal elsewhere are now lifted. • Estimated rainfall amount is from 10 – 25 mm per hour (heavy - intense) within the 600 km diameter of the Typhoon. • Residents in low lying and mountainous areas under signal #3, #2 & #1 are alerted against possible flashfloods and landslides. Likewise, those living in coastal areas under signal #3 and #2 are alerted against storm surges. • Typhoon “LABUYO” will enhance the Southwest Monsoon which will bring moderate to occasionally heavy rains over Southern Luzon and Western Visayas. •Fishermen especially those using small seacrafts are advised not to venture out into the western and southern seaboards of Southern Luzon and the eastern and western seaboards of Visayas due to big waves generated by Typhoon “Labuyo”. • The public and the disaster coordinating councils concerned are advised to take appropriate actions and watch for the next bulletin to be issued at 5 AM tomorrow. In line with the month long celebration of Buwan ng Wikang Pambansa this coming August 2013 with the theme Wika Natin Ang Daang Matuwid, we are compiling valuable slogans which you can incorporate in posters, essays, school projects, and events. At bibigyan kita ng isang bansang magulo at watak-watak ang adhika. Siyang sandata sa sa pakikibaka sa mundo. 15. See your slogan here by leaving a comment below. 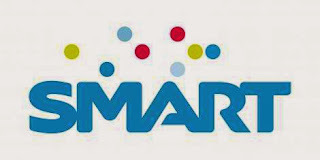 The leading telecommunications company in the Philippines, Smart Communications provides an array of unlimited call and text promos that will suit the mobile need and budget of every Filipino. We are listing down the updated call and/or text services promos or packages offered by Smart which you can avail, and the ways of registering and using them. One (1) day unlimited calls and texts to Smart, Talk N’ Text, and Red Mobile and free 20 texts to all local networks. One (1) day unlimited calls and texts to Smart, Talk N’ Text, and Sun Cellular and free 150 texts to all local networks. Two (2) days unlimited calls and texts to Smart, Talk N’ Text, and Sun Cellular and free 40 text to all local networks. One (1) day unlimited text to all local networks plus 60 minutes of call to Smart, Talk N’ Text and Sun Cellular and 10MB data mobile internet. One (1) day unlimited texts to Smart, Talk N' Text and Sun Cellular plus 20 minutes of call to Smart, Talk N' Text and Sun Cellular networks and free 20 texts to all local networks. One(day) unlimited calls and texts to Smart, Talk N' Text and Sun Cellular plus unlimited Facebook browsing through the Facebook mobile application.